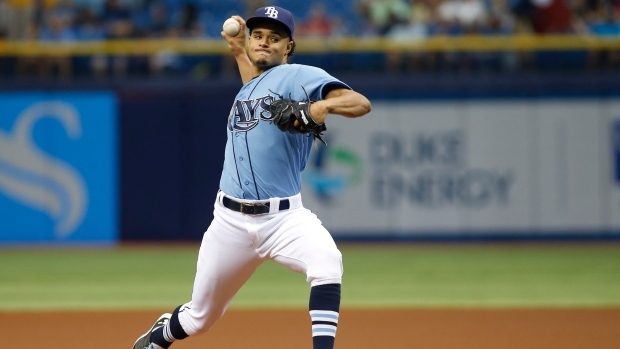 ST. PETERSBURG, Fla. - There was some doubt over whether Chris Archer would even be able to pitch Sunday. When he did make the start, the Rays right-hander exceeded all expectations, even his own. "I was honestly thinking if I could get through five (innings), that was going to preserve our bullpen a little bit," Archer said after pitching seven scoreless innings in a 5-1 win over the Toronto Blue Jays. "But my pitch count was in a good place and I still felt like I had a little bit left in me so they let me go." "I don't think we could ask for a better month out of a starting pitcher. He's been as good as I've ever seen," said Rays manager Kevin Cash. "You've seen him over the last couple years and he gets better and better and better," said Toronto manager John Gibbons. "He's got a dynamite arm, he's confident and a great athlete." "We had the bases loaded with no outs, and I feel like in that situation we definitely needed to get a run, and it gave us some more momentum," Guyer said. "With the way our bullpen is going, with a couple more runs we're definitely confident of getting that W."
"I feel better about this game than I did the previous two," Buehrle said. "But when you're up against a guy like Archer, he's been on this year." Rays: Tampa Bay plays it first game in open air Monday night at the New York Yankees. "I want to put some sunglasses on for batting practice," Rays manager Kevin Cash said with a smile. The game at Yankee Stadium will be Tampa Bay's 20th of the season. No major league team has ever gone this far into a season playing all their games under a roof.